Home laundries provided work for married women in Eton and Eton Wick. By the end of the 19th century there were five listed in the local trade directories. During the 19th century many of the village girls were in service, but it was home laundries which provided employment for some of the married women in Eton Wick. The Eton Boys' personal linen and clothes washing, together with that of many business people of Eton town, was done in small home laundries of Eton, Eton Wick and Chalvey. Even the opening of Eton College laundry in 1881 initially did not have a great effect on the home laundries. By the end of the 19th Century there were five home laundries in Eton Wick advertising in the local trade directories. Those registered as washer women in the village included Mrs Haverley, Mrs Sarah Miles, and Mrs Lanfier of Albert Place. One washerwoman, Elizabeth Kedge, who lived in part of the Vicarage, was laundress to her Majesty, Queen Victoria. Two Eton Wick men were also registered, Mr Frederick Burfoot of Alma Road and Mr Sergeant of Albert Place. Garden wells and water from the stream close by could well have aided the home laundry businesses in Albert Place, as piped water to the communal Pump or to individual homes did not come to the village until 1892. People remember how, before the Second World War, the Eton Boys' laundry was brought from College to Eton Wick using the family pram with perhaps the youngest child in with the dirty daily attire and in winter, mud caked football shirts, shorts and socks. This washing did not include the famous Eton Collar worn by Juniors as it is said that they were laundered, starched and ironed by the tailors who supplied Eton College uniform items, such as Tom Brown, established in 1784. Often the village Laundresses worked in groups to get through more washing and also ease their task. When taking a break from their labours, the senior would go to one of the village Pubs ‘Jug and Bottle’ to get a jug of beer for the other women, which perhaps helped with the task and their conversation of village affairs and scandal. Some laundress may have had a built-in 'copper' for heating water and boiling the clothes, while others used a large cast-iron crock pot over the fire of the kitchen stove. It was all physical labour with scrubbing board and scrubbing brush and agitating the washing in the boiling water with a paddle stick. Early manual washing machines, if affordable, were just a wooden tub fitted with a manually turned paddle - and later, the addition of a twin roller mangle to squeeze the water out of the clothes. This type of laundry aid was expensive, but sometimes cheaper copies could be made by a local jobbing carpenter and blacksmith and used on a communal basis. This could have been so in Eton Town where there was a communal wash house and drying area (it has been said that Eton householders could not hang out washing to dry if it could be viewed from the castle!). The Eton town communal wash house and drying area was to the rear of the Crown and Cushion Public house in Eton High Street, serving the needs of more than fifty people who lived in the adjacent two rows of cottages. Eton College, landlords of the Brocas field on the bank of the River Thames, did give permission for the Eton Laundress to spread their washing on the Brocas field grass to dry and bleach. Soap for the village washer women was probably home-made or bought from the Eton Starch Maker (who possibly made up blocks of soap as part of his business) or from other town hardware merchants. The early local soap was made from Lye water, by pouring rainwater through the cold ashes from a hardwood fire to which was added, in correct proportions, animal fat that had been melted down to a grease. The mixture was cast into a long receptacle of suitable proportion to set, and was then cut into mottled blue or yellow seven pound blocks and sold by the hundredweight. These blocks of soap were left to dry and then chopped into usable size. This method was overtaken by Lever Brothers in 1884 with the world's first name-branded soap, ‘Sunlight’, made specifically for laundry work. As more efficient products became commercially available, the art of home-made soap disappeared. 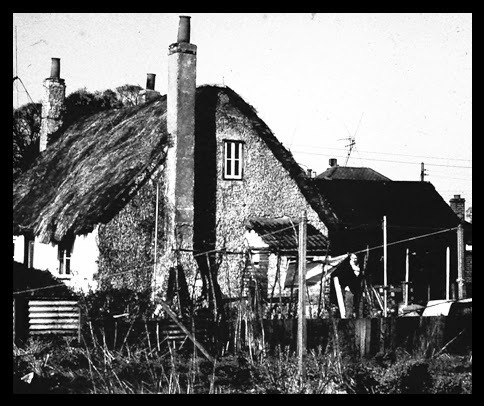 Washboards and scrubbing-brushes were used for really dirty items, and at Thatch Cottage a second small copper in the yard was used to bring back the whiteness to soiled tea cloths and similar items. At this laundry, the irons were heated and kept hot on a special ‘ironing stone’ with a ridged surface, which was set by the fire. In the home laundries, the main work of washing was usually done in the cottage scullery, where the copper produced the gallons of hot water needed. Mrs Miles converted one of the pair of cottages known as Vine Cottage into her laundry so that there was room for the various operations indoors, but at other laundries the business had to spread into sheds outside. At Thatch Cottage there was one for mangling, another for drying and a third in which the ironing was done. Some women did one job and others another. Woollen socks and sports gear from College were washed not at the laundries but by individual women, who collected them after games and returned them clean and dry the next day! Laundry women also washed for local gentry and business people, sometimes going to the customer's home to do the wash where, for their labour, the pay would be a few pence and a mid-day meal. But for the village washer women, the Eton College boys were their main customers. Today the new College Laundry deals with eighty thousand items of clothing a week, a far cry from the manual scrubbing days of the Eton Wick Washer Women of earlier years.